I've gotten quite a few requests to do a very simple look with no eyeshadow, and with a minimum number of products. So here it is! 1. When using a smudgy kohl pencil, do prime lids with an eyeshadow primer first to prevent creasing. Line outer half of top & bottom lash line. Create a wing at the corner by joining both lines. I used brown, but you can use black or any other color. The kohl just has to be one with a blendable velvety texture. 2. Line inner half of top lash line. It doesn't have to look even and neat, coz you'll be smudging it out. 3. Tightline the inner rim of top lash line right at the base of lashes and fill in any gaps. 4. Now it's time to smudge. With a fairly stiff smudger brush, start smudging the edges of the kohl to diffuse the color. *Your brush should touch ONLY the top edges of the line you've drawn, and try not to go near the roots of your lashes. 5. Gradually move the brush up to the crease line. Work with your eye shape. I have hooded lids, so I go up to where my crease is supposed to be. 6. Also smudge the lower lash line. I didn't all the way in, coz I didn't want my eyes to look smaller. 7. It should look something like that once you're done smudging. 8. A fluffy blending brush will blur out any harsh lines and correct unevenness. 9. Curl lashes & apply mascara on top and bottom lashes....and you're DONE! More: Dab a shimmery eyeshadow on the center of your lids with your pinky finger. You could also apply a black liquid or gel liner, depending on the look you're going for. 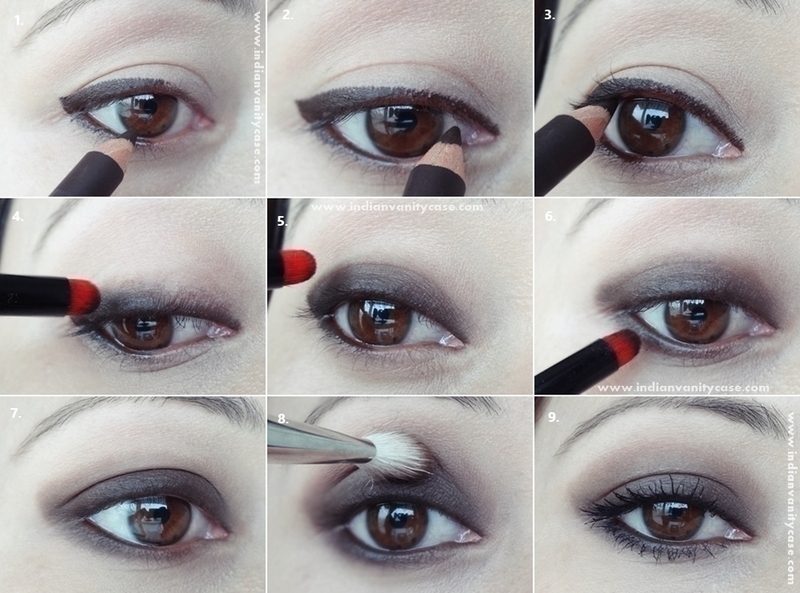 You can do anything now that you've achieved the base of any smoky eye. I hope you found this tutorial helpful & I will be posting the other promised Glitter Tutorial next week! Btw, did you How I Met Your Mother fans watch the series finale? I watched it last week. A FB status: "I will never forgive them for how they ended HIMYM! I want to cry!!! T_T"
I wonder whom she wanted to cry for. At least there's still Game Of Thrones! P.S. I am a big Game of Thrones fan too. It's unbearable to wait for an entire week for a new episode! Loved the look.. So simple yet so intense and gorgeous at the same time. I am the worse at eye-makeup...loved it! Really helpful and detailed tutorial, CZ. Cynthia , I have to share this with u. My mother passed away five years ago. So I go to my brother for any kind of sincere advise. Sometimes he is like *am I supposed to tell u all this ? * Sometimes he feels pity on me and cooperates. So yesterday , after going thru your smokey eyes tutorials , I decided to give out a try. I did with my best artistic hands. I went to my brother. In great excitement , I asked * bhai main kaisi lag rahi hu * ( brother , how am I looking ) he looked at me with wide eyes and said * sonia, why dont you do something about your dark circles !! * ( dark circles were reference to my smokey eye makeup ) Sigh !!! It was instant depression for me :'( seems I am several trials away before I can achieve your kind of finesse.